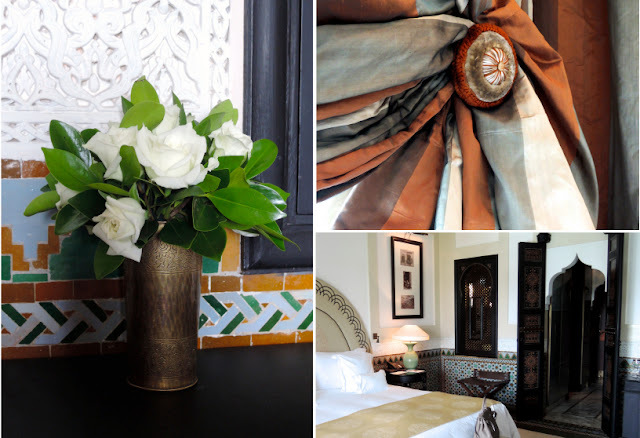 Marrakech is one of the places where it is hard to choose a hotel... there are just so many beautiful options! 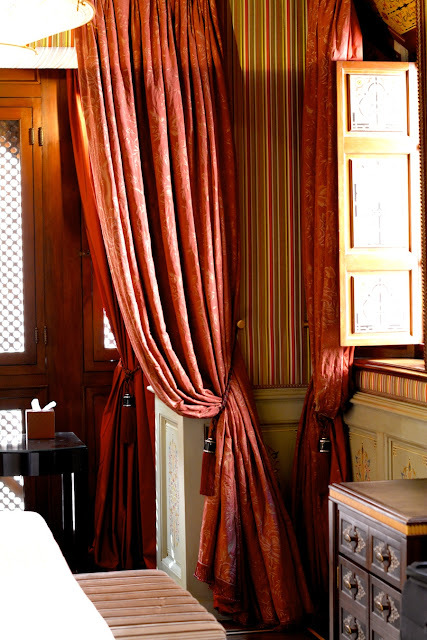 Some date back to the 18th or 19th century, when wealthy Moroccans constructed private retreats (riads) within the labyrinth of the inner city, the Medina. 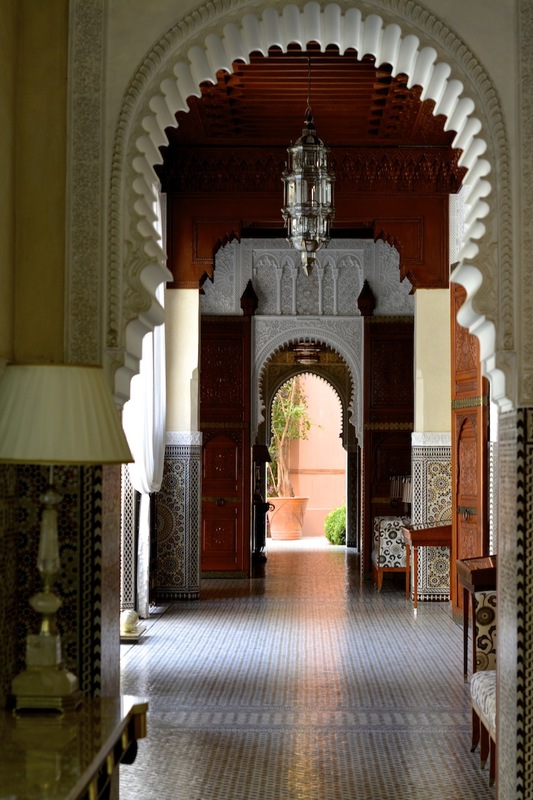 A riad is typically surrounded by an unassuming brick or mud wall, but when you step inside, a little paradise unfolds... you'll find mansions or small palaces which open their windows and balconies onto tranquil and shaded courtyards, or a fragrant garden filled with rose and orange blossom scents. Many of Marrakech's hotels are former riads, and for a good reason... after spending your day in the bustling and vibrant town, there is nothing more restorative than getting back to an oasis where you can listen to the soothing sound of a trickling fountain, or wander in a beautiful and peaceful garden. 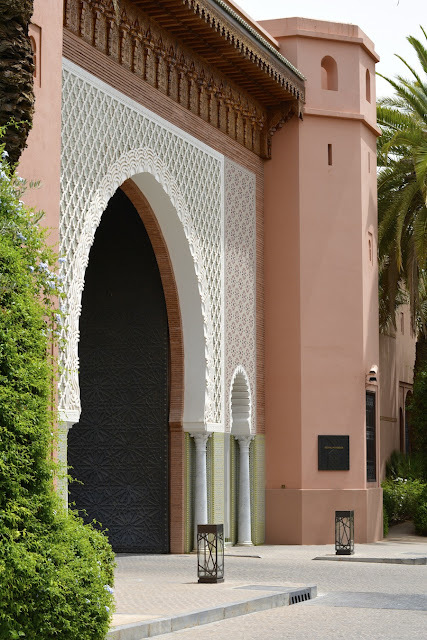 The La Mamounia and the Royal Mansour took my breath away more than any other place.. the La Mamounia because of its elegance and history, and the Royal Mansour because it's a modern day testimony to Morocco's centuries old traditional arts and crafts. 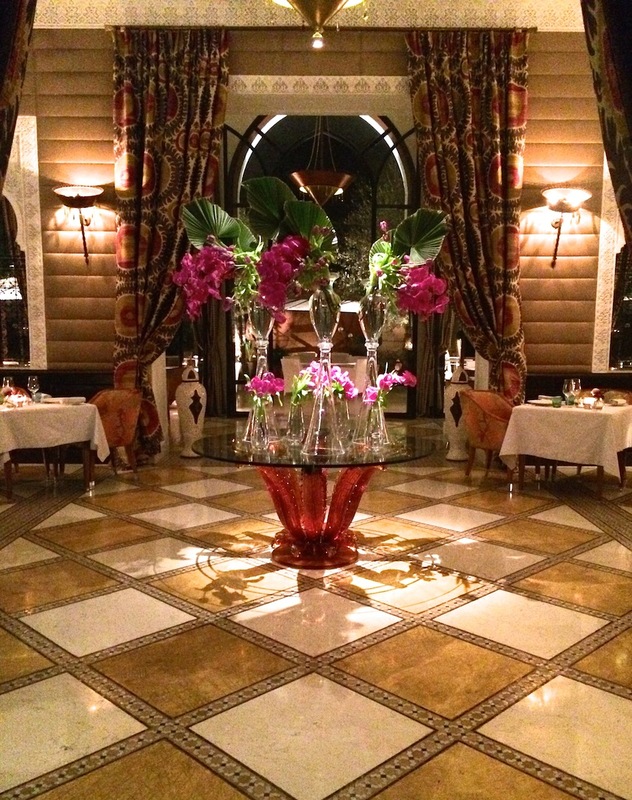 Regardless if you visit to spend the night, or if you go to enjoy a dinner or drinks... you'll be spellbound by the exquisiteness and magic of these places. The La Mamounia has been the grand old dame of Marrakech for almost a hundred years, and its history is as rich as the (frequently updated) opulent and elegant interior. 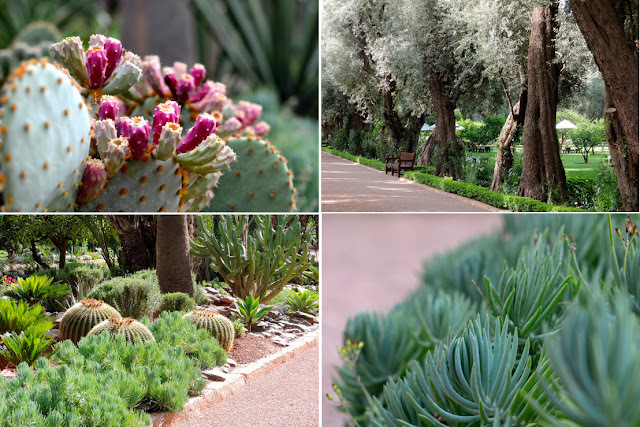 It opened in a glitzy ceremony in 1923, but the roots go back much further.. the 20 acre garden was once owned by the 18th century Prince Mamoun, who received it as a wedding present from his father, the Sultan of Morocco. Mamoun famously hosted extraordinary parties in his park, and when the hotel was build, it was named after the prince who the grounds once belonged to. Winston Churchill was a regular (he described it as 'the most lovely spot in the world') and Jacques Majorelle painted the ceiling of one of the dining rooms. 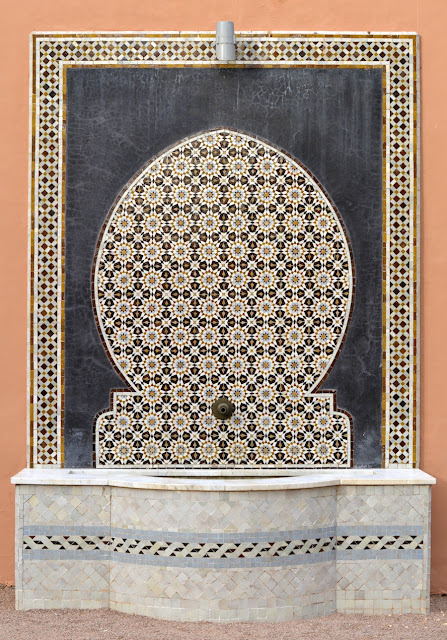 The beautiful and intricate geometric mosaics which decorate La Mamounia's columns, water features, walls and panels are called zellij. 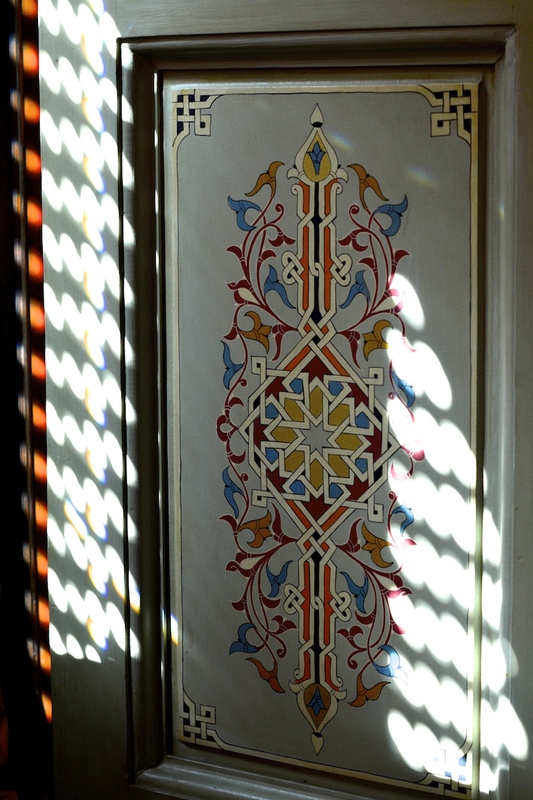 The making of these geometric patterns with enamel glazed terracotta shapes is an art form dating back centuries, and the knowledge and savoir faire is passed on from generation to generation of experienced craftsmen. The basis of my travel wardrobe consisted of black, white and cream pieces, which made for uncomplicated mixing and matching, and resulted in endless possible outfit combinations. A few colored prints and accessories provided accents and variety, and all in all everything was light and easy to pack. a beautiful cedar wood ceiling, painted and decorated by hand. 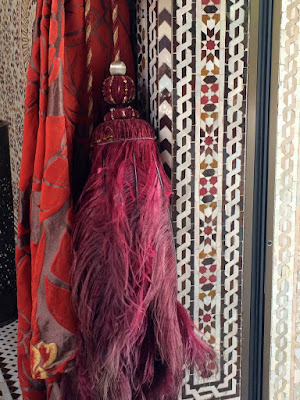 Accessories: 9 bracelets, 4 wool/silk stoles (click here), 3 silk twill 90 carrés, 3 pendant and tassel necklaces (click here) plus various earrings and scarf/shawl rings. Shoes: Belle Vivier by Roger Vivier. Fabulous photos! These are heavenly places and so different from our first and only experience of Marrakech - the old campsite just out of town. Where we stayed seemed like an old oasis in the desert, a place for nomads, with the tents pitched in the shade of huge old trees and a few flowering shrubs, but not far away was the baked red earth. And of course with such beautiful photos. 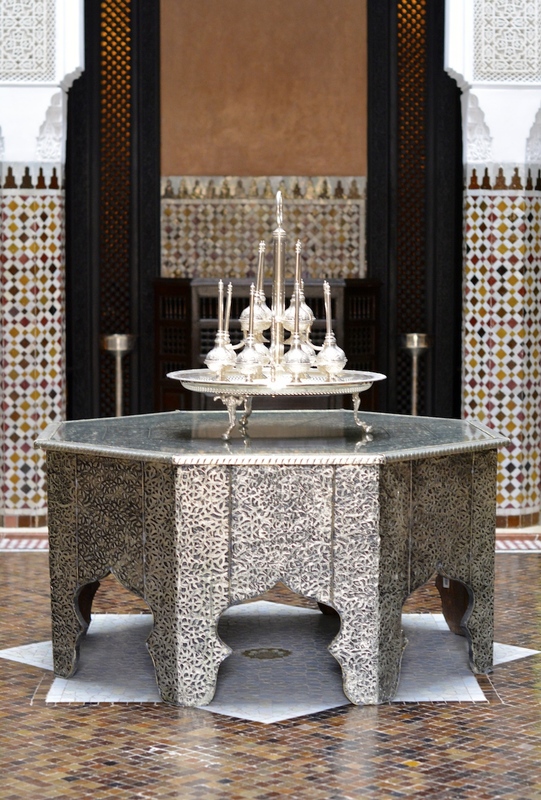 Shoukran jazilan for the visit, we really feel like oriental princess in the Palais des 1001 nuits ! Sequins and tassel were totally in their elements ;) Very very clever your jewelry case, it will avoid travelling with a suede pouch for each bracelet. Have a good week ahead dearest MT and ladies in Le Salon. Love the fabulous colours of these hotels a little bit of heaven I think when you are sitting in them at they end of a busy day. Have loved all three of your travel log stories, what a wonderful time you must have had and what memories to keep. Also cant wait for the new Jewellery case to come out how exciting. In all honesty, I'm happy to leave the monkeys and the snakes behind and move into the lap of luxury. 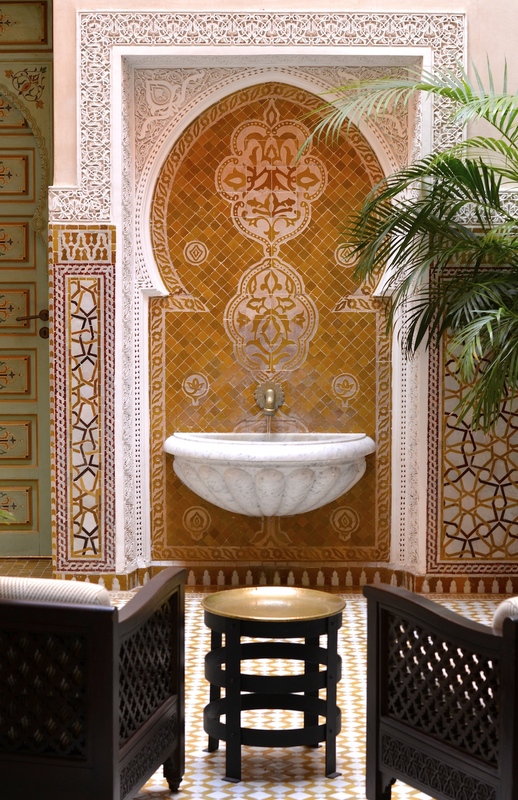 The colors and the details, especially the tile work, are all magnificent - that painted cedar ceiling - oh my gosh! And, I'm sure I could live quite happily at the Royal Mansour! I'd like to try anyway. You looked lovely,too - very cool and sophisticated. What an enchanting post and you are a vision! Thank you for sharing your experience from Morrocco and for introducing a new jewellery case, definitely a must-have for me. How absolutely exquisite! You've definitely added Marrakech to my 'must see' list. And, as always, your capsule wardrobe pics are a source of inspiration--thank you! Dear MaiTai, It's like a beautiful dream (the tilework! ), and your capsule wardrobe was perfect! 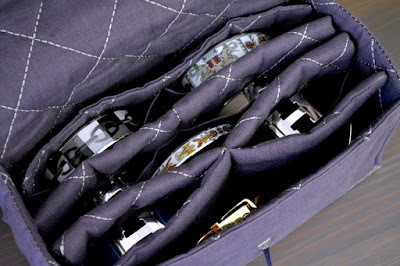 Looking forward to the launch of the new jewelry case. I cast my vote for a silver pendant as well, brushed or shiny, either would work beautifully. 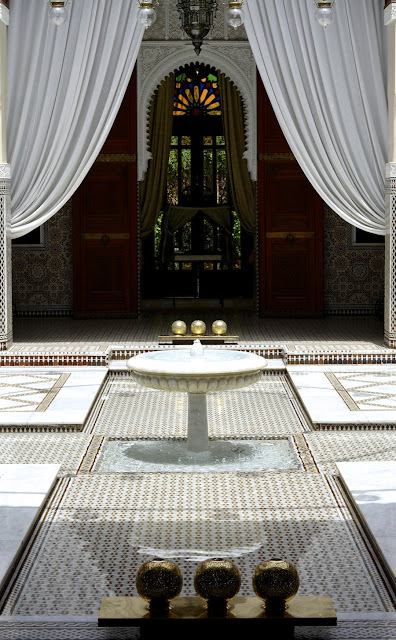 Jerrine, let's all move in to the Royal Mansour. What a reality show that would make! Yeah, Fif, let's get off that roof - too close to flying monkeys! 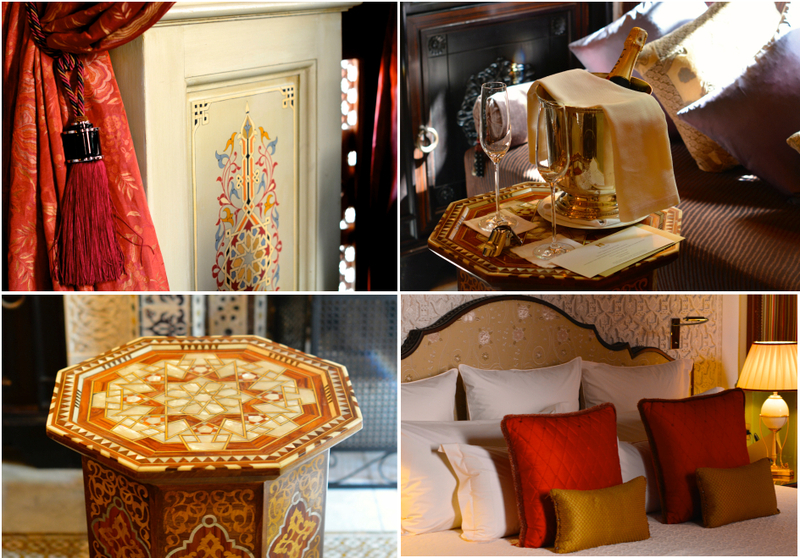 I think the Royal Mansour would suit us just fine. Of course, I have a feeling that I'd have to sell my H. collection to afford the privilege of all that luxury. Merci pour ces superbes photos (comme toujours !) qui font aussi de très beaux fonds d'écran pour ordinateur et m'aident à patienter entre deux voyages tout en suggérant de nouvelles destinations. Félicitations aussi pour le travail réalisé sur le site, cela représente beaucoup de travail mais le résultat en vaut vraiment la peine. Suddenly I felt I was far away in a beautiful palace, surrounded by the most enchanting and magical sorroundings. You look beautiful wearing your stole, perfectly in accordance with the Palace and its gardens. Oh, these retreats look divine, and as Jerrine mentioned, far from those pesky monkeys and slithery snakes! Your pics and prose paint a beautiful atmosphere! So thrilled you and yours got to experience this exotic locale and as always merci for sharing it with us! You look elegant as ever descending the stairs wearing your beautiful stole<3 I am still hoping for those leg extenders to be added to the MT Collection...long legged beauty,you! The leg extenders are divine, Trudye. I highly recommend them. I have worn my pair out and must buy another. Feathers are getting wet, the French rain has arrived here...hope you were not drowned, dear MT! Sorry small ladies but years ago I took an option on all the stock of these Nordic leg extenders as well as all the blond hair extensions. Now that we are talking about it, I'll take the long elegant arm extenders too! You ladies crack me up. I'm 5'8" so I can get by without leg extenders. I'd like the blond hair extensions, though. Do they come in silver? Same height, Fifi, but I'd still like to be taller with longer legs. We're never satisfied with ourselves, are we! PS - Now, Trudye, we elegant swans don't honk. According to Catherine, we tut . . . tut. Well, darling Manuela, I would say, "Good things come in small packages !" 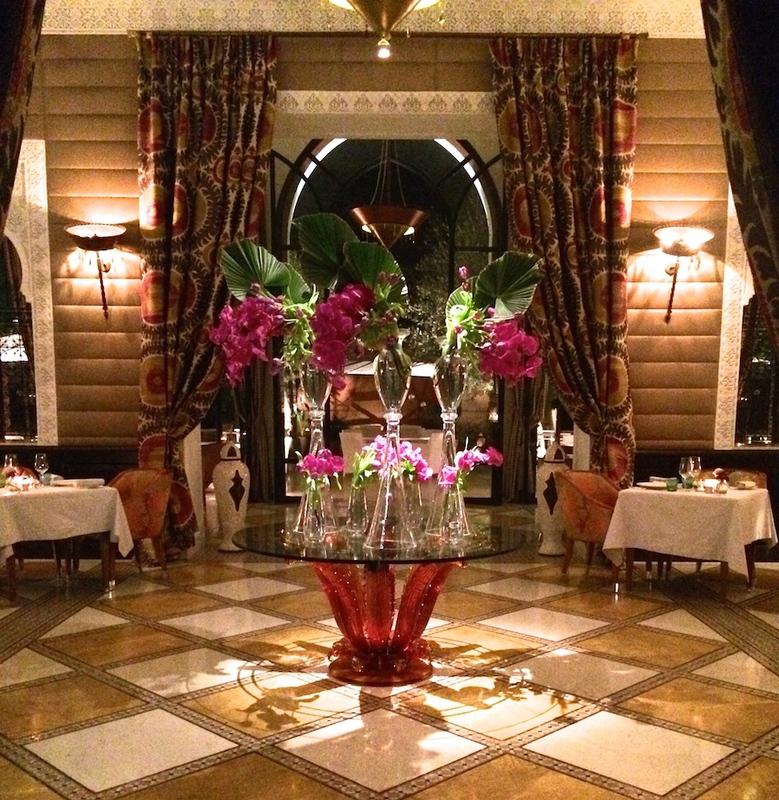 Thanks, dearest MaiTai, for sharing your excellent pictures with us! I love your blog. Your style is great. Thanks for sharing your pictures with us. 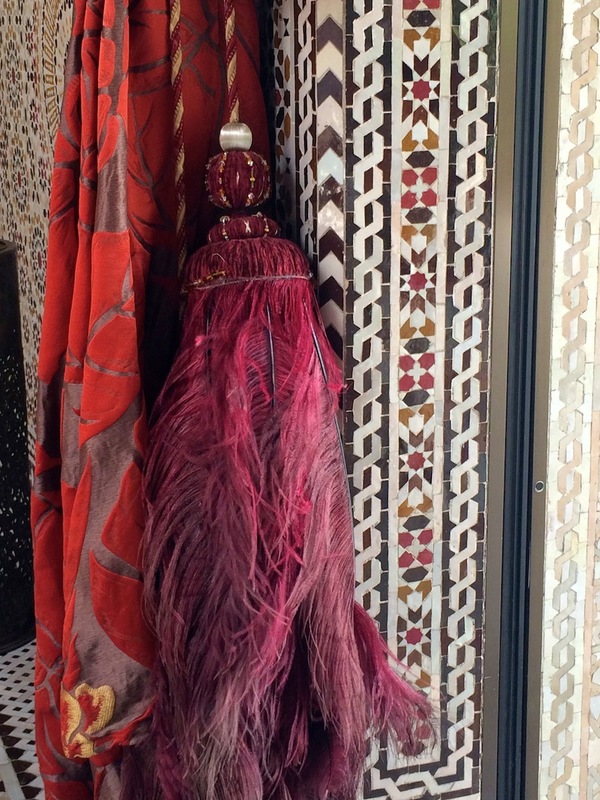 Marrakech is so particoloured. I completely admire your guarderobe to travel..... I need a full luggage plus a bag for beauty products, shoes, bathsuits, pareos, shawls, etc etc. Pullovers if cold, shirts if warm, one vest minimum , clothes for souk, clothes to travel around Morocco, diners, etc etc. One day, may be I will arrive to travel lighter....a dream for my husband ! My husband gets mad each time! the Hermes bug bit me a few months ago and while looking for knotting tips I found your blog. After reading nearly everything I wanted to thank you for all the time you put into it. I have enjoyed so much, it is a great sorce of inspiration - and very dangerous as well for my pocket, now I am thinking of a horn necklace Isatis, even I did not know I need one.... I will be in Paris on wed. next week and hope to check one in RL. I gladly join the fan club and looking forward to your next post. I adore your style and your wise words. Re your trip to Maroc your pictures took me back to our trip 3 years ago when we visited Fes, Rabat and Marrakesh. It was wonderful and I liked Fes the most. In Marrakesh we spent almost 2 hours in the souk to find the perfect candle holder made of wax with those adorable carving ... an in the Jardin Majorelle we fotographed nearly every pot and wall because the light and the colors were so fantastic... ah memories..... today I will cook something maroccain for dinner, I think. Hope you and your family come/came back well.